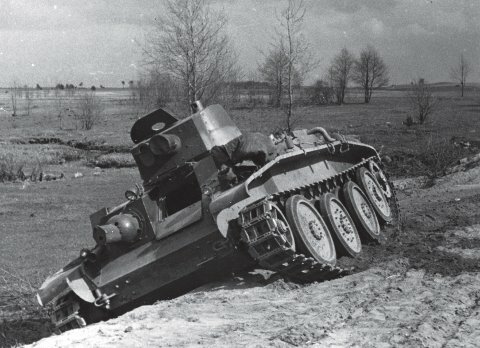 Poland chose to produce tankettes (The TK3 and TKS), derived from the Carden-Loyd Mark VI, more because of economical constraints than tactical choices. But there was also a real interest for another Vickers-Armstrong product of 1930, the Vickers 6-ton light tank of which 38 Type A and 22 Type B were ordered in 1932-33. This model served for a local development by the Ursus company, soon known as the 7TP. This was just one of several tanks models that the Army was looking on. Another was an American one, the Christie tank. Indeed, the 7TP was given the same old bogie suspensions systems of the Vickers 6-ton which didn’t made the cut in terms of speed. Whereas the American concept was soon copied by neighboring USSR and Great Britain for its Cruiser Mark III. 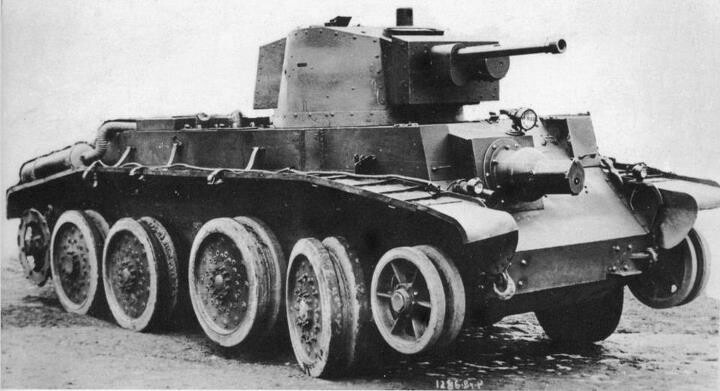 10TP without tracks in its original configuration. Narrow tracks were carried, strapped on the catwalks. 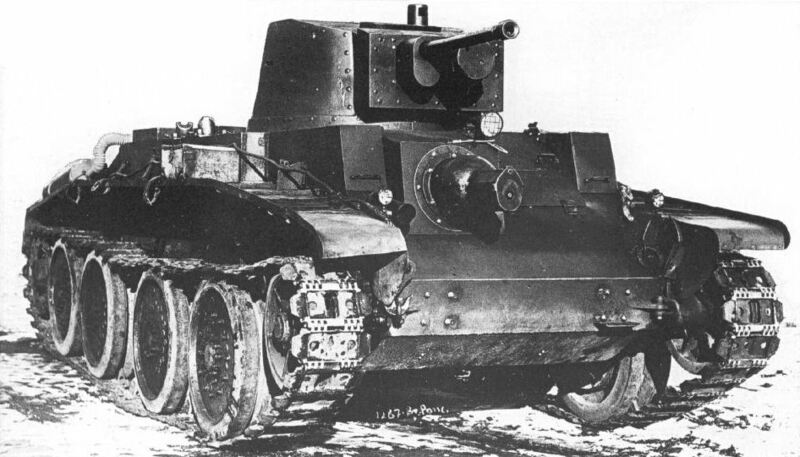 The 10TP, however, was born much earlier as the Military Institute of Engineering Research (Wojskowy Instytut Badań Inżynierii, WIBI) sent Captain Ruciński in a mission in the US to legally acquire a Christie M1928 tank plus its blueprint and license. But the deal never materialized. 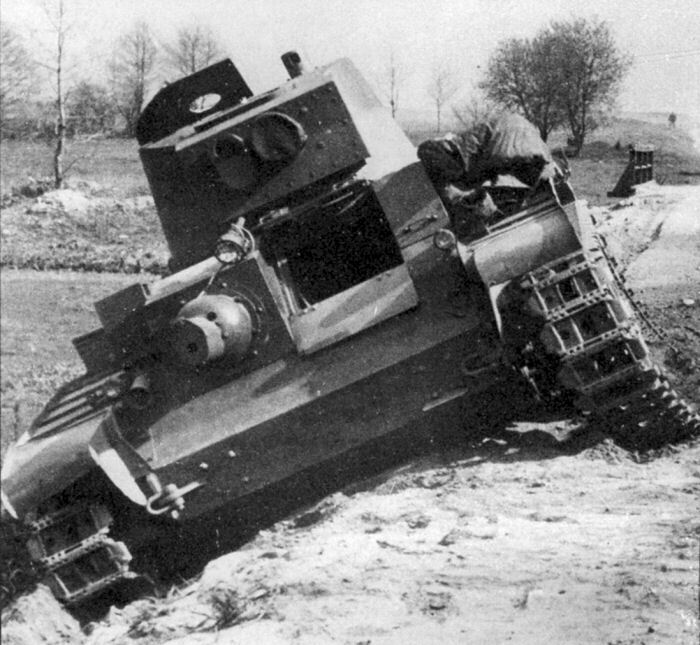 Therefore it was not before the early 1930s that the WIBI Tank Design Bureau took charge to create a local tank inspired by the Christie M1928 and M1931 after data, leaflets and notes taken by Captain Ruciński. The WBI design bureau was liquidated in 1934 and the project was interrupted by the more urgent 7TP. It was taken over by the newly established Design and Testing Centre of the Armoured Forces, but most of the original documentation has been lost or destroyed so it started almost from a blank page and on 10 March 1935 the 10TP officially started under supervision of Captain Rudolf Gundlach (the famous periscope designer). 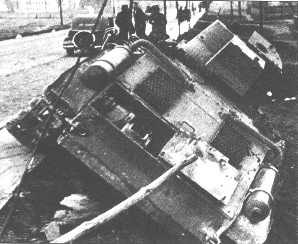 His team also comprised engineers Jan Łapuszewski, Stefan Ołdakowski, Mieczysław Staszewski, Kazimierz Hejnowicz and process engineer Jerzy Napiórkowski. The design was advanced enough to be officially approved and included by the Armament and Equipment Committee (Komitet do spraw Uzbrojenia i Sprzętu, KSUS) in January 1936 to the 1936-42 armament projection plan. It was specified to be given to four newly formed tank battalions and two motorised cavalry brigades. The final prototype was built by Experimental Workshop (WD), attached to the Ursus complex near Warsaw (PZInż), supervised by Captain Kazimierz Grüner. Because of the foreign engine and mechanical parts, delays amounted and the delivery did not occur before July 1938, it was ready eventually for tests on August, 16. Secret runs started under the supervision of the Trial and Experiment Department in the Bureau of Technical Studies on Armored Weapons headed by Captain Leon Czekalski. Trials stopped on 30 September to correct several minor defaults at the WD unit. Other long trips started from 16 January 1939 achieving a 2000km crash course on 25 April. Then it was completely dismantled at WD to check the wear on particular parts and assemblies and do extra corrections. Were detected and noted an above normal wear of the gearbox and clutches, excessive roadwheels and tracks fatigue, insufficient engine cooling and greater than expected fuel consumption. Externally, only the large roadwheels betrayed some connection to the Christie design. In fact, the 10TP was certainly not a copy of the Christie M1931 as the Soviet BT series was. The hull was significantly larger to accommodate two men side by side in the turret and two in the hull front (driver and co-driver/MG-gunner). Armour thickness was the same to the front, sides and back at 20mm, and 8mm on the bottom and top. Compartmentation was standard, with a rear compartment for the main engine, which was eventually a 12 cylinder American La France petrol engine which developed 210HP (245 stated by the manufacturer), coupled to a 5 gear mechanical gearbox. The tracks (one on two was teethed, double pin) had smaller links, more durable and made for a quieter ride. There was also a specific link hooking system. New drive sprockets (rear) were designed. Most importantly the the second pair of roadwheels were raising by using advanced hydraulic servomechanisms for steering. Both this and the hooking system were new and unproven, and caused many teething problems. Top speed was around 50-75 km/h which was certainly less than the BT series (almost 90-100 kph), due to a lower output and heavier weight. Range was 210km on roads but fell to 130 in off-road conditions with a 130 l capacity. The two-man turret, protected by 16mm slopes was the same model used on the 7TP, housing a high-velocity 37 mm Bofors wz. 36 coupled with a coaxial 7.92 mm Ckm wz.30. The bow machine gun was of the same model, but its watertank was encased in an armoured mantlet and massive ball mount. There were leather straps on each side to carry the alternative tracks stored on the catwalks. Eventually, a demonstration allegedly took place before the general staff (perhaps in May 1939). At that stage the idea was no longer to have a convertible (wheeled vehicle/tracked) model, to get rid of all the dual system complications and stick to a track-only model. The spare weight could be then reallocated to improve armour thickness. Therefore, the whole project shifted towards a new model, the 14TP tank. The fate of the 10TP is not known unfortunately. It could have been cannibalized to create the 14TP or stored, or conditioned to take part in the desperate fight in November. The 10TP would have been however comparable with the British Crusader and its 37mm Bofors was able to deal with most German tanks up to the Panzer IV. 10TP stranded after trials, being tracted in Radzymińska Street, Warsaw, 25 April 1939. Buy this print on RedBubble! Good article Quite interesting. The chassis looks like a BT7 with a Toldi III turret on top. One thing that you might like to rectify is the spelling error in the first paragraph, “choosed” is not a word, whereas “chose” is. I, at first, was quite surprised Poland even had tanks in WW2. They were captured right at the start, and they used horses for the battles the did fight during the period. But yet again, I was proven wrong. I will have to do more research on these Polish tanks. The 10TP I find particularly interesting. The Poles actually designed some decent tanks back in the interwar days. Unfortunately, they weren’t also available in numbers. And the “Horse vs Tank” thing is a myth, overstated by two subsequent propaganda machines. Poland was captured right at the start? Yes, Poland was attacked as first, but was defending until battle of Kock (2-6 X 1939), so it was for 36 days. It wasn’t easy campaign for German forces. Actually they would have much worse time if USSR won’t attack at other side in 17 IX. Second thing – yes, Polish Army used calvary units. But it was similar as in other armies of that time. U can look how many horses used Germans when fighting USSR. They even made calvary SS divisions, like 8th Calvary Division SS Florian Geyer. Calvary of that time weren’t use as knights in Middle Ages, but more as dragoons in XIX century (so as a calvary-infrantry). They moved on horses, but fought on foot. It made them very mobile, and with absence of wheeled or traced transporters calvary was good alternative. Oh yes, actual Nazi, and also Soviet, propaganda claimed that Polish Army fought on horses against tanks, which isn’t nothing more than a lie. That propaganda traveled around the world, made up minds of many people in different countries (ex. USA) and still living well in they thoughts. It is similar problem with “Polish death camp”, which actually was Nazi death camps just build in occupeied Poland. But this is different story, I just put this here as example. Btw, can u show that photo? As I know most of this kind fake information I can prove that photo is fake. Also, do u know that in interwar period there was such a thing like photomontage? And it was made purely to suport propaganda roles. Soviets used it quiet well to discredit former allies or clear them from history. Not the finest tank in the world! It was certainly pretty good for its time. These Polish tanks were better than anything the US had at the time.